The upcoming Gujarat farmers’ organization, Khedut Samaj - Gujarat (KSG), representing thousands of farmers of the prestigious Dholera special investment region (SIR) have, in a memorandum to Gujarat minister Anandiben Patel, said that despite promise made about two years ago, the Gujarat government has “failed” to settle the pending land rights issues of the farmers, who received agricultural plots during the land reforms days of the 1960s. Dholera SIR has been planned as one of the major smart cities along the Gulf of Khambhat in Gujarat on a largely agricultural area, which produces one of the best varieties of organic wheat, called Bhalia. The Gujarat government has declared its intention to impose town planning Act on the region, which requires farmers to give away 50 per cent of their land in the name of developing urban infrastructure. This has happened alongside the Dholera SIR authorities declaring that the beneficiaries of land reforms who have not received land titles now belong to the government. The memorandum was submitted to district collector, Ahmedabad, by KSG leaders Sagar Rabari, Pradyumnasinh Chudasma, Bhavubhai Mer, Ramdesinh Chudasma and Persis Ginwalla following a five-day-long foot-march, which was sought to be banned by the Gujarat government. The ban had to be lifted following a Gujarat High Court order in October-end. The padayatra of Dholera SIR farmers was set off on November 1, 2015 from village Sandhida and it covered a distance of 132 km. Among other demands put up in the memorandum was to cancel the decision to go ahead with Dholera SIR and to respect the promise of bringing Narmada waters to the region. 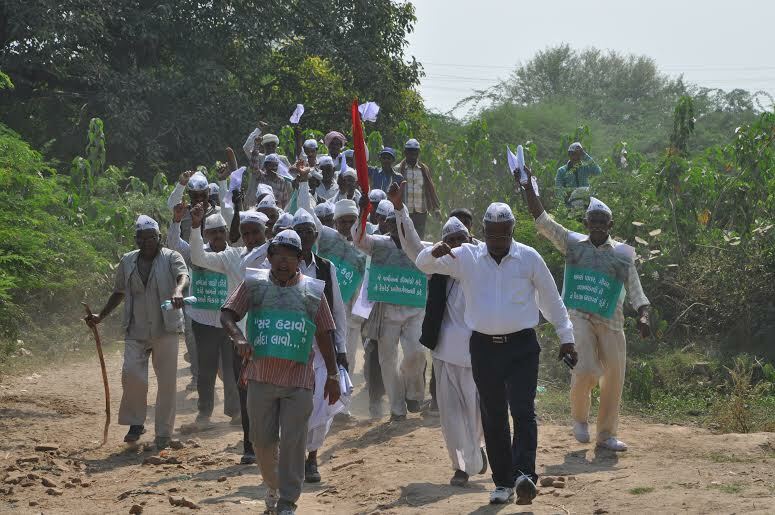 The memorandum said, the Gujarat government must hold land kacheris or official meetings in each village as part the Gujarat government promise during the Environmental Public Hearing of Dholera SIR in January 2014 for settling farmers’ land rights issues, and remove “government wasteland” in land revenue records for the plots which the farmers were cultivating. Other demands included allocating pastureland to every village according to its cattle population as per the latest cattle census, taking all the village water bodies on to the village revenue record and notify them as per the High Court order, increase the village residential areas, and allocation of surplus land to the landless agricultural workers, as per the government policy.